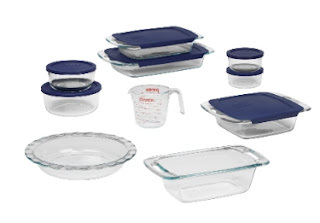 What a hot deal, right now at Amazon you can pick up this 17 piece Pyrex Easy Grab Bakeware Gift Set with blue lids for just $17.26 (Reg. $64.99). When checking out sign up for your free trial of Amazon Prime*and you will get FREE 2-day shipping. This would make a great inexpensive Christmas gift. *Sign up for your FREE 1 Month Trial of Amazon Prime and get all your Christmas gifts shipped to you for free. If you don't want to be billed the yearly $79.99 for Amazon Prime at the end of your trial just go to Your Account, and Choose the Manage Prime Membership, click Do Not Upgrade Automatically so that when your Amazon Prime trial ends you won't get billed. This is awesome so I don't have to try to remember to cancel before the month is over.